It has been a while since a real good behind the scenes production photo has surfaced for the films. We are always on the lookout for these types of images as the fans are always eager to see something new from their beloved film franchise. 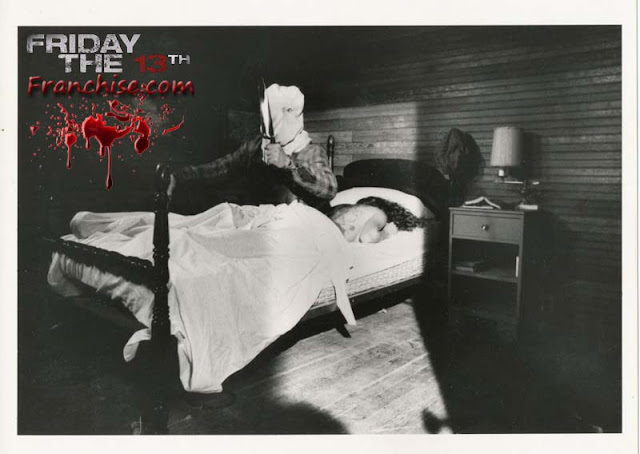 Today we have a very special production image from Friday The 13th Part 2 featuring Jason in bed. The infamous scene where today's photo was taken from is the aftermath of double impalement of Jeff and Sandra. Vickie enters the couple's room and is surprised by Jason Voorhees laying in the bed, under the sheets. It's a quick edit between Jason appearing and Vickie having her leg cut by a butcher knife. The image below is the first we are aware of that shows Jason Voorhees (Steve Dash) wielding the butcher knife while laying in the bed. Notice the body of Sandra laying in the bed next to Jason. It is a very creepy scene, and one that is sure to be exciting for fans of Part 2! Thanks to Sean James for posting this in the Forum!